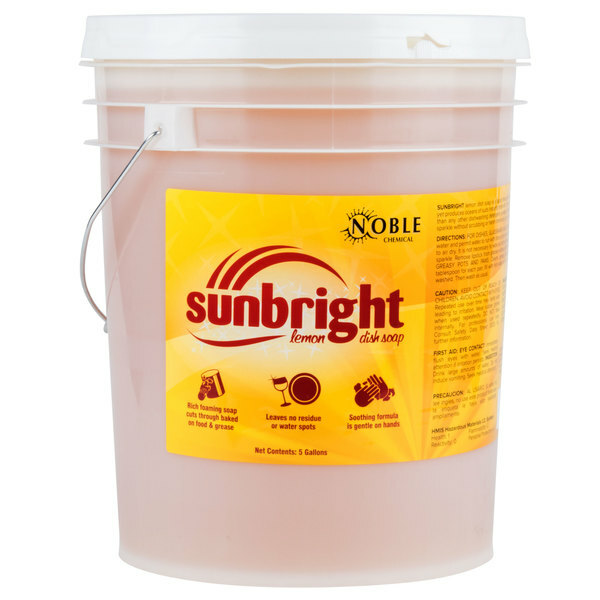 Keep your pots, pans, dishes, and utensils sparkling clean by washing them with this lemon-scented Noble Chemical Sunbright 5 gallon liquid dish soap! Not only does it have a high-sudsing formula to easily cut through grease, dirt, and food build up, it's also pH balanced for mildness and will leave skin silky and smooth. It removes lipstick from glassware without the need for scrubbing and won't leave any leftover residue that could affect the foaming head on beer. Plus, it contains biodegradable surfactants that will break down and decompose naturally, making it an eco-friendly alternative to traditional dish detergents. Coming in a large, plastic container with a pour spout, plastic cap, and durable handle for easy transportation, this liquid soap is both convenient and effective. To use, simply add 2 oz. of dish soap to your dishwashing sink and fill it with water. In the case of greasy pots and pans, add a tablespoon of formula to each pan, fill it with hot water, and let it soak while you wash other dishes. Keep your cookware and dinnerware items spotless by using this liquid dish soap in your restaurant or catering kitchen.